Establishing a SMSF with ABC Super Funds - takes the 'what do I do next' out of the process. Establishing a SMSF with abc super funds takes the 'what do I do next' out of the process. With as little as $200,000 in existing accumulated superannuation benefits, you can contact abc super funds to start your SMSF today. You provide some initial details and abc super funds begins the setup process. Employees can request that their employers direct super contributions to a fund of their choice, including a self managed super fund. 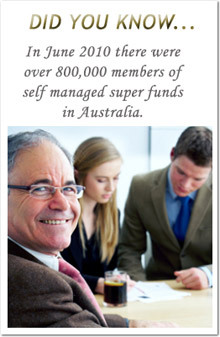 You will be given a binder with all your Superannuation Fund documentation for easy reference. The headaches with the forms and paperwork don't exist as the professional and experienced team at abc super funds handle all administration of the fund. all financial reporting and member statements. Ongoing assistance with investment strategies, life insurance and options are readily available and can be provided by abc super fund's financial planning arm. Contact us and speak to one of the team today - they would be delighted to answer any questions you may have. It's Your Money and Your Future ~ Let 'abc super funds' help you... from application to administration and drawing of benefits.